She has proven herself as a dedicated and determined teacher and has been enjoying in teaching for over 7 years with students in Korea, San Francisco, New York and Perth ranging in ages between 4-60 to further develop an understanding and appreciation for music. 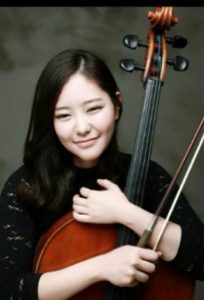 Cellist Hyewon Chang was born in 1992 in South of Korea. She has demonstrated her playing as one of the founding members of Luminis Ensemble in Korea and began her formal cello playing in Kyungwon University in Bachelor of Music degree where has performed as an assistant principal cellist of the school orchestra. In August of 2013, her passion led her to the United States to study at San Francisco Conservatory of Music as get a scholarship from the school. Not only she has participated in Master Class from Alisa Weilerstein with Saint-Saens Cello Concerto No.1 in A Minor at SFCM in the concert hall, but also participated in Texas Summer Orchestra Music Festival and Miami Summer Music Festival with full scholarship. If you have a setup at home and that’s where you’d like to have cello lessons, I could teach at your home.